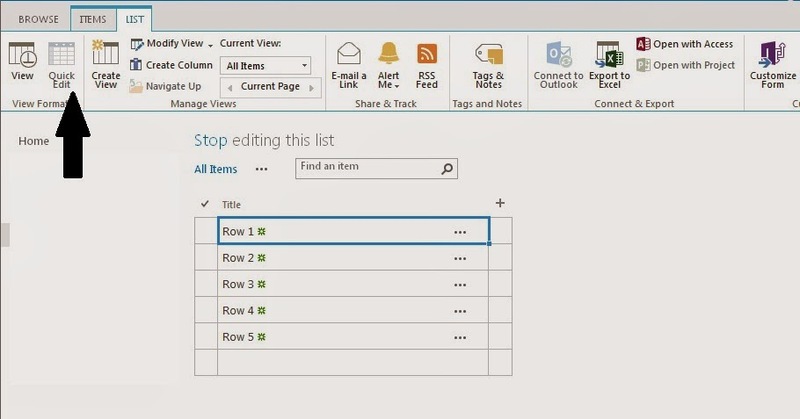 There will be scenarios where you would want to copy thousands of rows from Excel to existing SharePoint List in a site. There are a couple of ways this can be achieved without writing a code. This post explains both these approaches and also explain on which is the better option for huge number of data. In this approach, you have to switch to Quick Edit view of List. Then, you can copy data from Excel to Quick Edit view (provided the order of columns are same). This approach is most straight-forward and best suited for few hundreds of rows in Excel. If number of rows increase, this approach becomes more time consuming and also sometimes browser becomes non-responsive. In this approach, you will make use of MS Access to copy data from Excel to List. What I have observed is, this approach is pretty fast compared to Quick Edit and MS Access handles thousands of rows. Navigate to List View. Under List tab, click on "Open with Access" link as shown below. 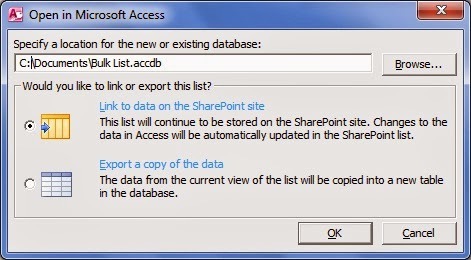 In the dialog box, select the physical path where you want to save Access DB file and ensure that "Link to data on the SharePoint site" option is chosen and click OK.
Now, MS Access opens and in the left side, you can see an Access table with the same name as List. Double-click on that table to open in the right-pane. Now, select the new row in Access (in screen shot above, cell just below "Row 5"). Here, ensure that you have selected the entire cell (It should not be in type or edit mode). Now, copy the data from Excel and just do Ctrl+V (paste) into Access. When you get prompt for confirmation, click Yes. Wait for some time depending upon volume of your data and it'll display all the rows copied. Now, go back to your SharePoint List and refresh the browser. Your data is reflected here! Another beauty of this approach is, if there is any error for specific rows, Access prompts it and it continues with loading of other rows. 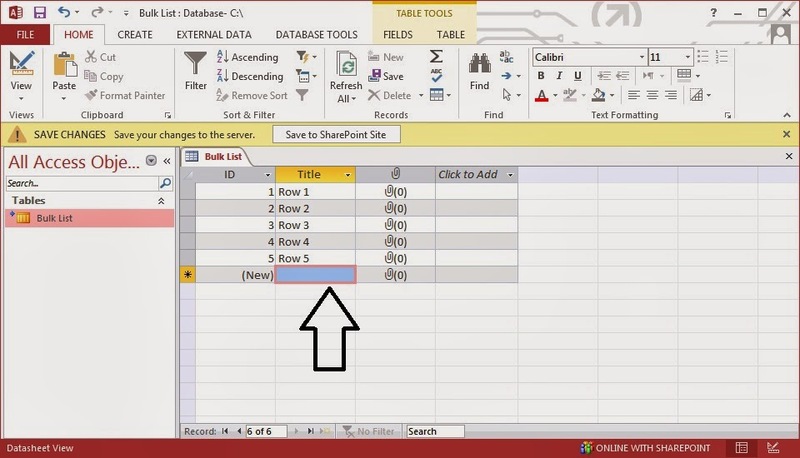 It stores problematic rows into a separate table in Access for analysis. How did you cut and paste from excel to a SharePoint list in option 1.? Select the rows in Excel (not entire row but specific rows and columns), Copy, switch to portal which has datasheet view, point the mouse icon on first column on the blank row, do Ctrl+V.